Ms. Jennifer Faraon is currently serving as an NGA International Liaison Officer in Europe, to advance NGA’s international foundation mission. She was formerly the Deputy Division Chief for the Source GEOINT Transformation Office at the National Geospatial-Intelligence Agency. As Deputy Division Chief, she was responsible for guiding NGA’s transformation in visualization services, NGA acquisitions of web and mobile applications, including NGA advancements in mobile technology. 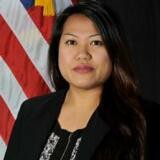 Previously, Ms. Faraon deployed to US Fifth Fleet NSA Bahrain, leading GEOINT technology transition activities. In the span of her career, she has served as the NGA Liaison to OPNAV N2N6 and supported the Chief of Naval Operations, US Navigator of the Navy and the Deputy Director for Naval Intelligence. Ms. Faraon provided critical liaison support during the USS Guardian(MCM-5) grounding and she was also the NGA Liaison to US Southern Command, supporting Humanitarian Assistance and Disaster Relief Operations. In this role, she was responsible for supporting GEOINT disclosure and release activities for relief efforts during the Haiti and Chile Earthquakes, both occurring in the year 2010. Early in her career, Ms. Faraon was assigned to the NGA International Office, supporting numerous international partner engagements. She has served as an Intelligence Specialist in the US Navy at US Pacific Command and has a Bachelor’s Degree in International Relations with a concentration in Psychology. She speaks 3 languages and has received military and civilian awards which include the Joint Service Achievement Medal, two ODNI Meritorious Unit Citations and the Secretary of Defense Global War on Terrorism Civilian Service Medal.